Our Libertyville chiropractic office is easy to find! 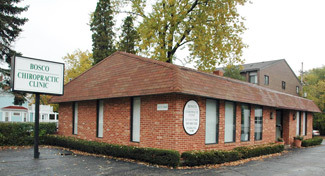 Bosco Chiropractic is a referral-based chiropractic practice in Libertyville. We use this website to explain what a chiropractor can do—and what a chiropractor doesn’t do. Are you suffering from headaches or back pain? Or perhaps ways to get well and stay well that avoid drugs or surgery? You’ve found the right place! Because finding a qualified chiropractor in the Libertyville-area begins and ends right here! Take the first step towards relief by calling our office today. Countless other Libertyville-area folks already have! Call our Libertyville chiropractic office today! I feel like I’ve met my extended family at Bosco Chiropractic Clinic. Everyone was so friendly and the care was outstanding. Great Dr.,Great Staff, Great Service! Thanks!! Very informative visit. Look forward to working with Dr Bosco. I felt confident Dr Bosco could help me. Dr. Bosco is very knowledgeable as well as personable. Very professional, explains everything as he goes along and courteous bedside manner. My kids really like him too and ask to get adjusted – even my three year old! I’m very pleased with the knowledge and compassion that I received during my visit! Thanks for getting me in so quick. Chris was very nice and welcoming and so is Dr. Beggi. Nice friendly atmosphere. Dr. Bosco and his staff always make you feel important. I was nervous, this was my first experience with a chiropractor. I’m happy to say that it was a very comforting experience! Looking forward to my next appointment. Dr. Bosco and office staff were very patient and informative about each procedure. Very friendly and professional staff. Doctor Bosco is very friendly, reassuring, professional and very knowledgeable of his practice. The office is very clean and well organized. It was the best experience I have had with chiropractic care. The office is very professional. They explain your findings ind entail and provide you the best treatment. Love the office. I recommend this office to everyone. Dr. Bosco was very informative and knowledgeable. My first visit was very nice. I look forward to my next visit. I was able to get my first appointment very quickly, in a matter of days. I feel like I’m part of the family already. Dr. Bosco and the staff were very friendly and honest. They took the time to explain the procedures and how things work. I will definitely refer them every time! I’m very impressed with Dr. Bosco’s practice so far and look forward to a good result of improved health base on his expertise. I am very pleased with Dr. Bosco. His treatments have already made me and my children feel better after only a couple visits. A very warm, welcoming office and staff. Everything is explained thoroughly and all questions are answered. A great experience – Thank you! Dr. Bosco was very through, and I felt very comfortable. Quality customer care, keep up the good work its a rare commodity. Very knowledgeable Doctor! I would recommend him to anyone! Dr. Bosco and staff are excellent! Very informative, attentive, and caring. Highly recommend to all nurses, lpn’s, cna’s who are prone to back injury due to work. I have been seeing a Chiropractor for over 20 years. I moved to the area a few months ago. After my first adjustment I know I’m in good place. He gentle and Intuitive in adjusting the subluxation of my spine.